Mending luxury bags has become a profitable business for one store owner in Shanghai who is capitalizing on the country's growing obsession with brand name goods. Shi Xi reports. 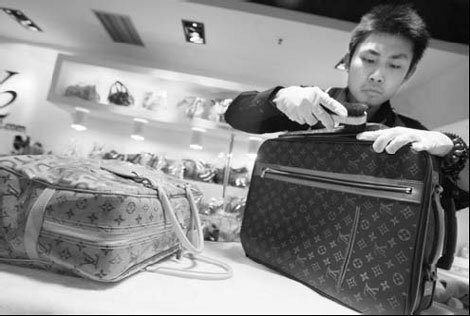 It took three months for Zuo Dengjuan, 21, from Anhui province, to become a first-rate luxury bag mender at Sac lgant. "I was working at the inspection and quarantine department before and knew nothing about luxury bags. I spent one month learning to distinguish between real and fake brands and gradually learnt how to wash off stains and fix cracks." While a luxury bag has become a must-have for the well-off in China, those who own them are becoming increasingly aware that you have to look after them too. Hence, the spread of luxury bag mending shops that provide efficient, personalized and professional standards of service. "Young people appreciate luxury and it is essential to be able to distinguish between colors and different types of leather. Seemingly trivial differences can mean a lot," says Sac lgant's owner Duke Du. Zuo is one of Du's favorite students because she is so diligent. "One bag takes two to three weeks to mend and every month I have to deal with 40 to 50 bags. Sometimes it is hard to meet the quota but the commission is quite seductive," she says. Zuo says she earns 2,500 yuan ($391) in basic salary and commission and bonuses are based on the number of bags she mends. "Our services are usually recommended by the big brand stores," Du says. "After proving our technical strength, we cooperated with major luxury brands and they have become our most effective promoters." Located on busy Nanjing Road West, Du rented a small store in the Shanghai Center. Packed with a huge variety of colorful luxury bags, some needing attention, the small store welcomes a steady flow of clients. "We have 16 assistants in total and our goal is for each of them to maintain 40 to 50 bags a month," Du says. He came to the Chinese mainland at the end of 2002 to work for a Singapore export company, but found that business was hard going. He started his store when his patent leather shoes were practically ruined by a cobbler. "My shoes had been left in the sun and had dried out," he says, which prompted him to think about how service for leather goods could be improved. According to the 2010 Hurun Wealth Report, there are 875,000 millionaires in China. This enormous market potential has attracted the luxury brands. According to a report released by BCG in 2010, the quantity of luxury stores in Shanghai and Beijing has already exceeded the number in New York and Chicago. What is more, some second-tier cities in China are now welcoming these big brands. In 2010, the Chinese luxury goods market was worth about $10 billion and by 2014, it is expected to become the world's largest consumer of luxury goods. "In general, Shanghai people are strong consumers and are fashion conscious," Du says, adding the city is one of the best places in the world to establish a store. Meanwhile, insurance worker Yu Yang, 25, has a problem with her Gucci bag, which was stained by her clothes. She is worried there is nothing Sac lgant can do about it. "But according to the staff, the problem can be easily repaired with a special kind of cleaning agent," she says. "Stains, cracks, discoloration, scratches and other problems need to be carefully inspected and then we will provide advice," Du says. "There was a Miu Miu bag costing about 8,000 yuan ($1,252), but we paid out 5,000 yuan for the damage we made during mending," Du says. He says his biggest problem is the number of copycat stores that are opening up, but who lack in skills. "We start at 300 yuan each bag and then we charge based on what needs to be done. Washing, replenishing colors, cobbling, are all charged at different rates." Another area of business for Sac elegant is selling second-hand bags. "Some owners of severely damaged bags want to exchange them for money, allowing us to do second-hand business as well." As for the future, Du says, he plans to expand further by establishing a salon for high-end bag owners and bringing in other luxury goods.